So if you've saved lots of HD MKV, M2TS, MTS, AVCHD videos and want to watch on iPhone 8, problem will arise. This is because that iPhone 8 only supports limited video formats like M4V, MP4 and MOV. To cater to the needs of playing HD videos on iPhone 8 limitlessly, this guide shares one solution to convert MKV video to iPhone 8 compatible format (H.264, MPEG-4) with the aid of HD video processing tool. 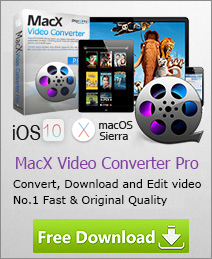 To get this job done, MacX Video Converter Pro is highly recommended, with almost any input video supported, be it SD videos like WMV, FLV, AVI, Webm, MP4, MOV, etc or HD video such as MKV, M2TS, MTS, AVCHD, Blu-ray video, etc. It is able to convert MKV/M2TS videos to iPhone X/8/7 as well as iPhone 6s/6s+/6/6+, Samsung Galaxy S9/Note 8, etc, all with fatest speed (5x faster) and no quality loss! Below is the step-by-step guide about MKV/M2TS to iPhone X/8 conversion on your Mac (10.14 Mojave) and Windows (10). Best HD video transcoder to decode videos in MKV, M2TS, MTS HD formats to iPhone 8/Plus/X/7/6s/6/Plus/SE more with 5X faster speed and high quality. Free download MKV/M2TS to iPhone 8 converter, get the Mac version or Windows version based on your computer. get it installed and run on your Mac. Navigate the mouse and hit "Add File" button to import your HD video such as MKV, MTS, M2TS, etc. Or you can add more than one video by simply dragging them to the main interface. Once finishing MKV/M2TS importation, there will pop up the output profile pane where you can select the output format directly. Here you can simply go "Apple Device" -> "to iPhone Video" -> "iPhone 8, Plus" or "iPhone X (H264)" and then press the "Done" button. Click "RUN" button to start converting HD video to iPhone 8 on Mac. After conversion finished, activate iTunes, and then you can sync MKV or M2TS to iPhone 8 for enjoying on the move. Tips: this video encoder supports to encode MKV to MP4, FLV, AVI, WMV, MOV, etc with subtitle. For those who wanna add external subtitle to the video before conversion, Hit the "Edit" button on the main interface and click "Enable subtitle" button to load an external subtitle file (.srt) to the video. Therefore, you can enjoy MKV video on iPhone 8 with preferred language.